It’s time to stuff your face folks. Have a crowd to feed? Need to use up a bunch of vegetables? Got a hangover that needs curin’? This will do the J.O.B. It’s summer comfort food at it’s veggie best! These nachos are piled high with tons of fresh summer vegetables and layered with ooey-gooey-melty shredded cheese. Top them with your choice of condiments and it’s a gosh dang party in your veggie-lovin’ mouth! The spring sun is out and that means it’s time to fire up the grill! This is a simple, bright and refreshing side dish that goes well with just about anything. 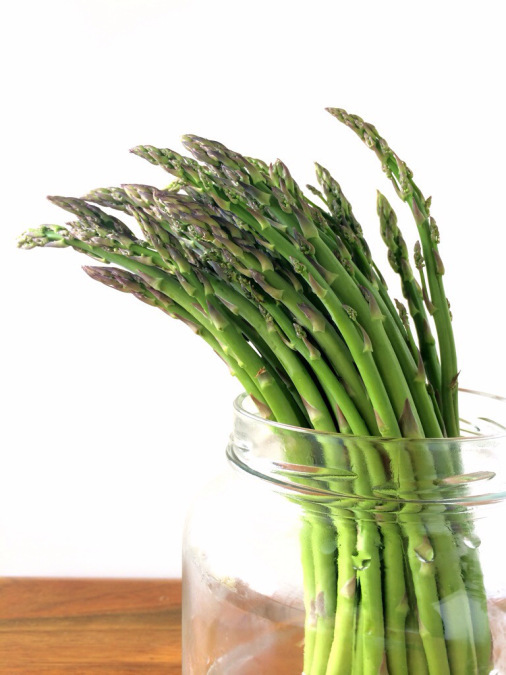 It’s perfect for a weeknight dinner, and while the asparagus is marinating you can get the rest of your meal ready and preheat the grill…and pour yourself a glass of wine. Because wine’s important. And so is multitasking. With wine. St. Patrick’s Day is almost here and every year my husband and I throw a party to celebrate the awesome food, music, and jovial spirit of the Irish! Some of our favorite musicians (Imelda May, The Tossers, The Pogues, Glen Hansard) will fill the air of our house as we join in merriment with our dear friends. And of course, one of my favorite parts about it is the food! I love to come up with variations on Irish dishes and this year I’ve turned the quintessential Irish dish — Shepherd’s Pie — into an appetizer. I did a vegetarian version (topped with Irish cheddar cheese) and a vegan version (topped with mashed potatoes)…they’re both insanely delicious and will have you tapping your toes to an Irish jig! Need an easy, one-pot, healthy side dish to go with dinner? Try this! These sweet and spicy carrots are so simple to make and have just a few ingredients! We’re going for easy clean-up with maximum flavor! Happy 2015! I took a few weeks off of blogging – spent time with family and friends, enjoyed the holidays, read a few cookbooks, relaxed a lot – and now I’m back in the game with this super simple and majorly delicious carrot salad! I’m tempted to say this is for a New Year’s healthy eating resolution, but it’s not. It just happens to be a healthy salad that came about from me getting a new vegetable peeler that I’m in love with. It’s got a super sharp blade, is light and easy to hold and really fun to use…plus it’s very inexpensive! I did make one resolution this year, though, and that was to give more high fives. Yeah! Hello and welcome to the 2014 Virtual Vegan Potluck! I’m so excited to be part of the VVP this year and want to give a huge shout-out to Annie, Angela and Poppy for organizing this worldwide virtual foodie event! Be sure to check out all the awesome vegan recipes by way of the Go Forward/Go Backward buttons at the bottom of this post. You can also go back and start at the beginning of the potluck chain. Have fun, get hungry and enjoy! For a very, very long time I’ve been trying to figure out how to make perfectly crisp skillet potatoes. The kind of potatoes that give you that supremely satisfying CRUNCH as you bite into them but are gloriously silky and creamy in the middle. I’ve been looking for a fool-proof method that would work every time…and I found it! This is it. And they are indeed crispy…crispy with a capital C-R-I-S-P-Y. And to top off these wondrous carbs, I made a buttermilk ranch sauce — because everybody secretly knows ranch is the BEST. My CSA box last week was the perfect example of seasonal transition. It was filled with tomatoes, cucumbers, eggplant, green beans as well as potatoes, pumpkin, sage, kale and butternut squash (and more!). It was a box that kept surprising me as I pulled out the eclectic mix of seasonal veg. It also served as a happy reminder of what being a member of a CSA is all about…reconnecting our food system to what’s grown locally in a way that’s sustainable to our particular climate and region. Ok, so today IS officially the first day of fall, or tonight rather…but where I live (southeast Missouri), there are still tomatoes and peppers aplenty. And thank goodness for that, because this recipe has me swooning. Plus it’s insanely easy. You take a buttload of tomatoes, a couple bell peppers, a couple jalapeños, an onion, some herbs, and a hellaton of garlic and douse it with olive oil. Season it with salt and pepper and roast it for 1 1/2 hours. It turns into a lovely melted spreadable pool of sweet spicy caramelized summer veggies. It tastes similar to a Fra Diavolo pasta sauce. You will love it. I definitely love it. Even my not-such-a-big-fan-of-tomatoes son loves it. And the best thing about it is it’s versatility. I like to spread it on toasted bread, but it would perfect as a pasta sauce. I also used it in kale and black bean quesadillas. You could serve it over grilled mushrooms or fish. Or you could puree it and add some tomato juice or milk/cream for a spicy tomato bisque. So many possibilities!